Many New Jersey colonists had looked forward to the appointment of a royal governor by the Crown as a positive change from the rule of the proprietors, but the first appointment in 1702 by Queen Anne was of a 42-year-old bankrupt, Edward Hyde, Lord Cornbury. A cousin of the Queen, Cornbury previously had been named governor of New York; New Jersey was added to his responsibilities following his arrival in the colonies. The new governor also initially protected the interests of the New Jersey proprietors, who had left hefty cash gifts with him soon after his assumption of the governorship. When the proprietors declined to meet Cornbury’s demands for a salary similar to the amount he was receiving from New York, he switched sides to back the anti-proprietary forces by disqualifying proprietary candidates for the assembly and handing majority control to the opponents of the proprietors--again aided by cash bribes and the assembly’s new willingness to provide funds to support Cornbury and his administration. The governor also rewarded his benefactors by convincing the Crown to amend voting requirements to once again allow all freeholders to vote and by giving the anti-proprietor faction the power to build roads, which they sometimes used to condemn or divide the properties of their opponent landowners. In West Jersey, the anti-proprietors used their new majority as retribution against their pacifist Quaker landowners by enacting legislation requiring every man to own a gun, muster four times each year and pay a fine if he did not appear for duty. "He was a clever man. His great insanity was dressing himself as a woman. Lord Orford [Walpole] says that when Governor in America he opened the Assembly dressed in that fashion. When some of those about him remonstrated, his reply was, 'You are very stupid not to see the propriety of it. In this place and particularly on this occasion I represent a woman (Queen Anne) and ought in all respects to represent her as faithfully as I can.'" In 1711, Governor Robert Hunter--frustrated by the undermining of his authority by members of the Cornbury Ring--allied himself with the proprietary forces of East Jersey. To retaliate, the leader of the Cornbury Ring, Daniel Coxe, Jr., sought to organize opposition by fomenting dissension based in Burlington among holders of land titles derived from the original Nicolls’ conveyance. In 1715, Coxe’s organization succeeded in gaining a majority in the assembly, which Hunter contravened by promptly dissolving the body. 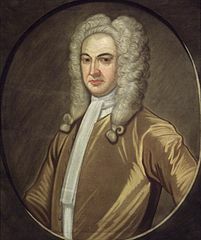 Following a second election won by the Coxe forces and another order by the governor dissolving the legislature, Hunter regained control of the assembly when Coxe boycotted the session and the Hunter loyalists expelled Coxe and eight other members for committing a “breach of trust.” Hunter finally sailed home to England in 1719, later warning the government on the basis of his tenure in New York and New Jersey that the colonies were moving toward breaking their ties to the mother country. In 1738, Lewis Morris, a member of a wealthy family that owned much of what is now the Bronx as well as lands in New Jersey, convinced British officials that New Jersey should become a colony with its own governor. Morris had previously served as Chief Judge of the New York Supreme Court, and subsequently was appointed or elected, commencing in his early 20s, to a series of New Jersey council and judicial positions, from which he was frequently removed or suspended for his outspoken criticism of the policies of the governor. Before the arrival of Lord Cornbury, Morris also had served briefly as acting governor of New York and New Jersey. The lobbying by Morris and his influential family succeeded in his being named as the first royal governor to administer New Jersey alone apart from New York. Despite his advocacy for New Jersey's interests, once appointed Morris demonstrated an arrogance in his relations with the assembly which increased opposition to the role of the governor. In addition to his political roles, Governor Morris also owned and and operated the Tinton Iron Works in what was then Shrewsbury, now the municipality of Tinton Falls in Monmouth County. Comprising some 3,900 acres, Tinton was the largest and most complex of only about a dozen ironworks erected in the colonies.